radial tyres as an alternative to classic cross ply tyres. The radial tyre was first patented by Michelin in 1946 after years of research. The beauty of the radial tyre design is that it separates the functions of the sidewall and crown of the tyre, allowing greater vertical flexibility whilst ensuring that there is still as much tyre surface in contact with the road as possible. 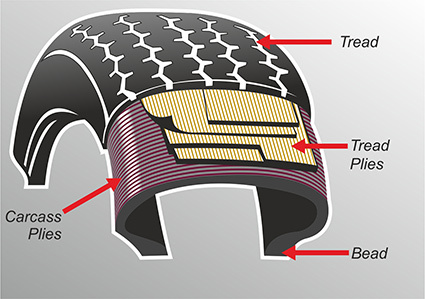 In classic radial tyres the sidewall has a one or two layers of textile cord giving good flexibility and the radial tyre tread is made rigid by combining the casing layer with two (or more) layers of steel cord bracing plies of the radial tyres. Both these factors give the classic radial tyre excellent road holding capabilities and a longer life span when compared to classic cross-ply tyres.